QuickBOLT’s Microflashing is now a registered trademark. Microflashing is a component of the QuickBOLT and Low Profile QuickBOLT Mounting Kits. The QuickBOLT is the world’s first and only UL Certified Microflashing mounting system. The patented QuickBOLT with Microflashing technology seals roof penetrations and can be installed without lifting shingles or removing nails and staples. The QuickBOLT with Microflashing has been installed over 600,000 times with zero leaks. In 2012, SolarRoofHook changed the mounting industry by creating the QuickBOLT with Microflashing, the first and only flashing-free, leak-proof solar mounting solution for asphalt shingle roofs. By eliminating the bulky flashing, SolarRoofHook has helped countless installers save time and money with the simplest, quickest, and most affordable mounting system on the market. 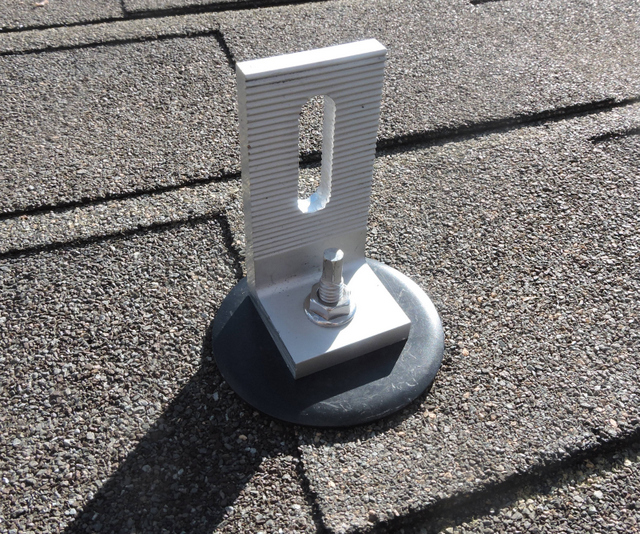 In 2017, SolarRoofHook came up with yet another time-saving asphalt shingle roof mount – the Low Profile QuickBOLT with Microflashing. Unlike the height adjustable L-Foot of the QuickBOLT, the Low Profile QuickBOLT includes an L-Foot that sits flat on the Microflashing without having to make any adjustments. This feature eliminates a step from the installation process, allowing the Low Profile QuickBOLT to be installed in less than 60 seconds – the fastest installation time yet. The fixed height of the Low Profile QuickBOLT also takes the struggle out of creating a level array. Simply mount the Low Profile QuickBOLT and secure the L-Foot for a ready-to-go level array that requires no adjustments.